Redactem is Elliott Marc Jones's first release. He recently took some time out of his day to answer our inquiries about life-changing moves, steam achievements, game design, and future plans. First, a personal inquiry. In your Reddit AMA, you mentioned you’re from the UK, but currently reside in Taipei. That’s quite a distance! What brought you all the way to Taiwan? I've been learning Chinese for a long time, and after I finished college I knew I had to take the next step, live in a Chinese speaking country. I really only had two choices, China or Taiwan and because of visa issues I settled on Taiwan in the end. I landed in Taipei in 2015, and did all kinds of jobs like web development, English teaching, but whilst doing all of that I was working on Redactem, which has now been released. I'm actually back in the UK for a little while now with my partner, meeting family and friends, we'll be leaving the UK again in November when her visa expires. Did you experience any “culture shock” as part of the move? Not really, and that really surprised me. I felt at home straight away and knew I had picked the perfect place to live. When developing a game, is there anyone assisting your process somehow you’d like to give recognition? With Redactem, it was just me and my graphic designer Piotr Kotlinksi. I would like to give some recognition to my partner though, because she was very patient whilst I worked on the game all day and night. And how did you and Piotr Kotlinksi meet? I met Piotr on the 'Working in Taiwan' Facebook group a few months after development of Redactem had started. May I ask about the design philosophy behind the Steam Achievements for Redactem? That's a question that will be irrelevant by the time this interview goes live as I am changing achievements completely in the next day or so, but the reason there are lots of super easy achievements in Redactem right now is that I was once an achievement hunter back on the PS4 and I used to love the feeling of finding a game that you could get hundreds of achievements within a few hours and wanted to create that with Redactem. However, since implementing this, I have had a change of opinion, and feel that Redactem's current achievements are cheap which is why I'll be changing them to be a little more traditional soon. In a previous interview with Sam Adonis, you alluded to Redactem being a “monster,” stuffed with tons of useless features prior to release. What sort of features did you have to cut while designing by subtraction? There was a digger for mining metal, a rope swinging ability, a javelin, slo-mo jumping, it was a mess. But hey, I learnt how to do loads of new things in the engine I used. Were there any specific reasons you chose to design Redactem in Construct 2? The fact you know I used Construct 2 impresses me, as I don't think I've mentioned it anywhere yet, but the reason behind it was that I got it whilst it was on sale a while back, and didn't fancy forking out hundreds of dollars to get the latest version of some other engine. Construct 2 is a really great engine, and although I think the developers who created it are a little bit rude on the forums, It's still the best out there for new devs. 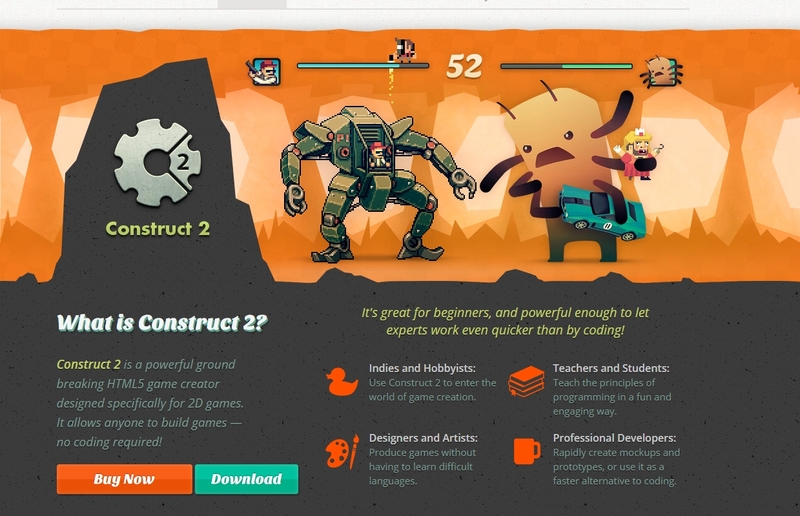 Construct 2 is a game engine built for 2D games. 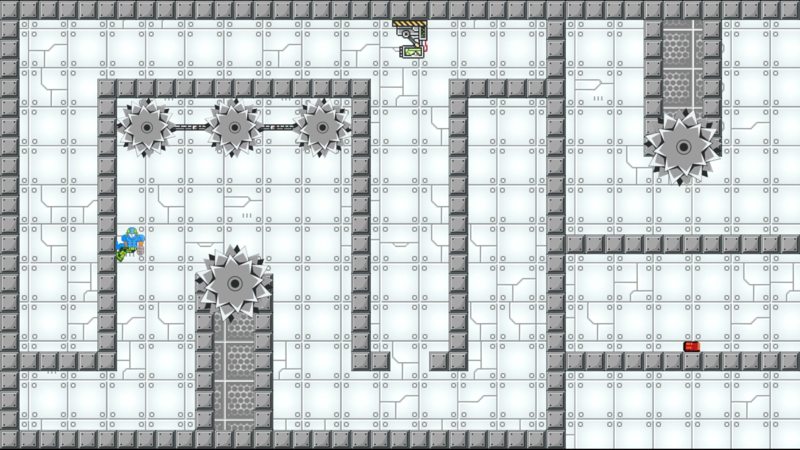 It’s available on steam to demo for free, if you’re inclined to try your hand at designing. Can you tell us a little more about some of the unreleased games you've made in the past? Have any favorites among them? Well, the first game that I ever completed, if you could even call it a game was a clone of Windows 98. As part of a college project, we had to make a top down game with a bunch of set features. I wanted to make something a little different so I created a very believable clone of Windows 98 in Game Maker. I still passed the assignment though as I added the top down game as an application inside the Windows 98 clone. While we're on the topic, did any mechanics from those unreleased titles make their way into Redactem? Almost! I really wanted to add a computer into one of the levels of Redactem as an Easter egg, that once interacted with would bring up a non trademarked clone of Windows 98, perhaps Doordows 98. What games inspired you to start making your own? 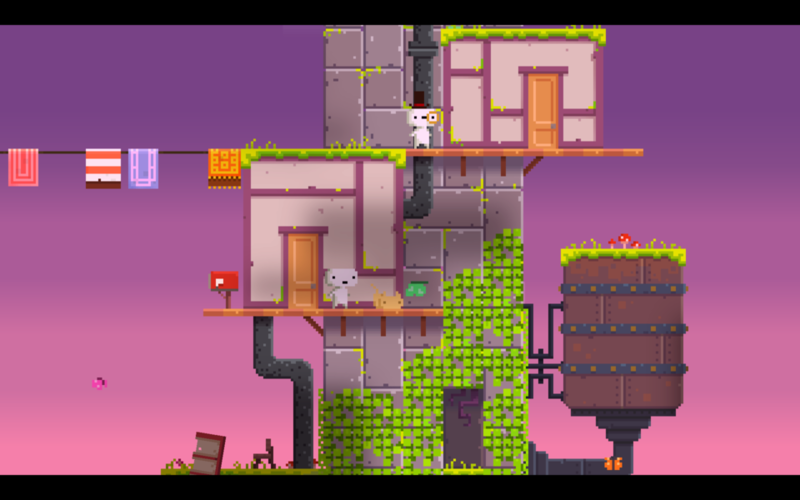 It's a bit of a textbook answer ever since Indie Game: The Movie came out but genuinely, Super Meat Boy, Fez and Braid. I guess that explains some of the features that are used in Redactem. What do you do when you aren’t designing games (or traveling 6,070 miles)? Over the last year, because of Redactem, not a lot! I did still manage to fit in some Chinese learning though! Now that Redactem is out, how much of your time is spent interacting with players or fielding questions from people like myself? During the first week of our Steam launch, I was at my desk all day replying to people and fixing bugs, but now all the major problems have been fixed I only spend about 2 hours a day doing this kind of thing. When Redactem first released on IndieGameStand, what were you happiest with? And likewise, what did you think needed the most improvement? I always knew that IndieGameStand wouldn't be our most important platform, but because we hadn't been Greenlit at the time and needed a professional store, I decided to put a lot of effort into it. I was really happy with the feedback we got, and that people wrote reviews in the first place. IGS suffers from a lack of reviews, which I think is why Redactem managed to get to the top rated game so fast. It's unfair on other games really. Is there anything you’d like to address regarding upcoming plans for Redactem, or any other upcoming projects? I'll be adding Steam trading cards to Redactem and as mentioned earlier changing the Steam Achievements in the next few days, along with small changes like the music not restarting after death. I'm also going to start accepting fan submissions for levels, to go along with the levels I plan to release for free over these next few months. In regards to my next game, it has a working title of Sudden Moves and will be a top down, open world game that uses Google Maps data to create real life cities with the game's artwork. It would allow you to walk down your very own street, if you so wished. We're starting out with Macau as our first region for the game. And finally, I thought we’d end on a sillier question. What two video game NPCs would you like to have as roommates? 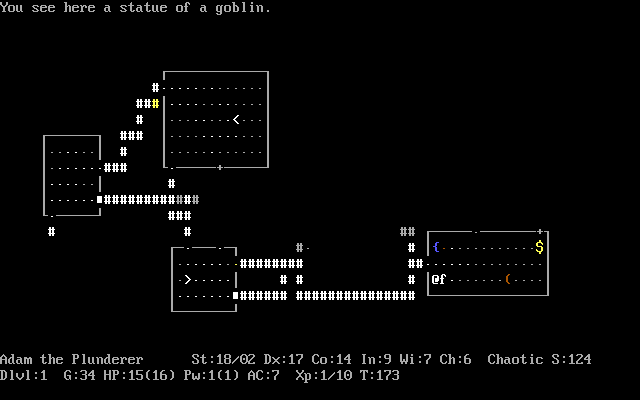 The dog in Nethack, and the dog in Nethack alone. I’m 80% sure there’s a dog in this picture. Maybe 75%. Another big thanks to EMJ for taking the time to answer our questions. Our review of his game, Redactem, can be read here.